As 2012 draws to a close, the two most impactful reforms China has set in motion within the healthcare space are the ongoing expansion of the country’s insurance plan and attempts to reform its hospitals. The latter is one of the more complex and multi-faceted aspects of China’s overarching objectives as part of its 2009 investment and 12th 5 Year Plan. Hospital reforms in China draw together several different stakeholders with many times differing objectives. As one example, the Ministry of Health’s desire to change how hospitals generate revenue (away from drug prescriptions) has not been matched by increased funding by the Ministry of Finance. Among the many insights offered by the Anhui Pricing Model is that even if the central government as supported by the Ministry of Health wants to pursue more sophisticated HTA protocols for evaluating prices versus efficacy, if this desire is not supported by supplementary funding from the Ministry of Finance, the provincial authorities will take liberties in how they make up any budgetary shortfalls. In late November the South China Morning Post (SCMP) wrote, “hospitals in China resist bid to reform drug sales.” The specific reforms that have caused the most problems for China’s hospitals include the attempt to eliminate the 15% mark-up hospitals could charge for drugs. According to the SCMP article, “Although more than 300 county-level hospitals have implemented the price reform since Chen announced it at the beginning of the year, only a dozen city-level hospitals – including two in Beijing and 10 in Shenzhen – have stopped charging the mark-ups.” (emphasis mine) Why do hospitals resist this reform? As the SCMP points out, “Drug sales usually make up half the average mainland hospital’s income while government subsidies account for another 8 to 10 percent.” I am aware of one think-tank study that suggests in rural areas, drug sales account for up to 90% of a rural hospital’s revenue. This back and forth perfectly captures the complexity of reforming China’s hospital system, and it is worth unpacking what each stakeholder’s concerns are. First, the concerns of the MoH who wants to make sure drugs are not being over-prescribed. Their concerns range from poor use of limited funds on the part of the Chinese people to over-prescriptions resulting in drug resistant viruses. Not to mention the ethical quandaries and reputational damage done to China’s current group of doctors who have been complicit in this over-prescription. 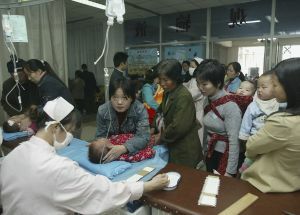 Second, the MoF wants to see China’s hospitals be as self-sufficient as possible. Many of the legacy issues China’s hospitals face are the direct result of diminishing government (MoF) funding for the last 30 years, which has made them reliant on things like drug prescriptions to supplement their meager payments from the central government. This tension was perfectly obvious in the SCMP article which added, “Hospital chiefs said implementing the reform without the corresponding government support would force hospitals to seek other sources of revenue, such as in ordering patients to undergo more check-ups.” Make of that comment what you will, but let me suggest one thing it suggests: these Chinese hospital administrators have little confidence they will get the necessary funding to make up for the anticipated shortfalls if they were to implement the prescription mark-up reforms. Third, how patients view these reforms. While outsiders see the benefit to reforming how Chinese hospitals generate revenue, patients may bristle at what they perceive as lost treatments. Keep in mind that healthcare consumers in China, especially in rural areas, still suffer from a general lack of education. If previously a patient with particular health problems went in and received a particular drug regimen and diagnostics (even if a large part of both were costly and un-necessary), only now to get significantly less of both, what will an unsophisticated healthcare consumer make of this? Not properly explained, many of these reforms may fail unless Chinese consumers quickly recognize benefits as part of the broader body of reforms taking place. Fourth, where does industry fall into this body of reforms (and, it should be noted, is their view different if they are domestic versus multinational pharma)? Ideally, the Anhui Model proves to have limitations that industry can exploit. Already we are seeing pushback both in terms of the development of alternative, and more sophisticated plans for the national formulary. In addition, the implications to the broad adoption of the Anhui Model work against some of the economic development goals specific to life sciences that constitute important parts of the 12th 5YP. Yes, industry wants access to the Chinese market. But the trade-off between volume and margin now has a third factor: technology transfer. Industries in China have been through this before (aviation, chemical precursors, IT, etc. ); but the precise interplay between how the MoH will guide policy reform, where the MoF will supplement hospital’s revenue so industry has some confidence the motivation for hospitals to mark drugs up has changed, and how the Party wants to see a domestic life science industry evolve remain significant issues that will need to be resolved. Obviously no one knows how this will shake out. In the short term, there are likely to be more problems such as those set in motion by the Anhui Model. We may find that sales practices by pharma have been compromised due to many of the same issues Chinese doctors have faced when over-prescribing. Inevitably, one of the technology transfer relationships an international pharma company engages in will create problems in its home market. But, at the end of the day, the immense opportunity to sell into, and develop within, the Chinese market will hopefully keep the focus of industry. When you consider that these concerns from so many different stakeholders all go back to an effort to reform how Chinese hospitals fund themselves, a sense of just how complex this whole process is likely to be takes on additional meaning.